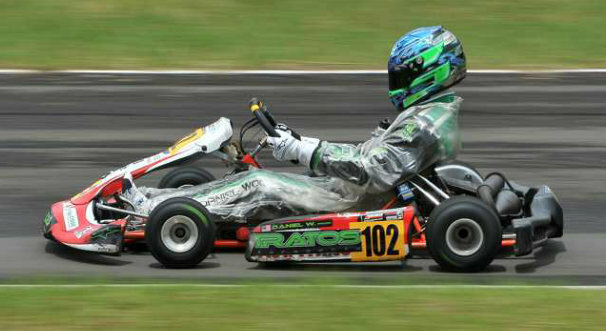 Stratos Motorsports was delighted to get invites for two of its drivers to compete in the Indonesia Kart Prix 2012 that took place last weekend at the Sentul International Circuit near Jakarta. Malaysian Daniel Woodroof was invited to compete in the Rotax Max Junior category and Indonesian Tommy Soebroto in the KF2 category. The Indonesia Kart Prix began as an annual event in 1980. The races were very popular among top world and Asian drivers. For various reasons, the event stopped in 1990. Indonesian Motor Association (IMI) is proud to bring back the Indonesia Kart Prix for 2012. European karters were invited from Italy, Belgium, Denmark and Sweden and Asian karters competed from Malaysia, Indonesia, Thailand and India. The competition was tough with almost full grids in all categories. The weather had a part to play too as on Saturday there were rain showers off and on all day. The competition consisted of four races – two on Saturday and two on Sunday – with a qualifying session to determine start grid positions for each day. Points were awarded for each race to determine the overall winners. On the Saturday Daniel Woodroof qualified second but had an engine problem in the first race that dropped him back to 14th. This was solved and in race 2 he battled back from 14th to 6th. On the Sunday in race 3, Daniel came 5th and then in race 4 had a great run to finish 3rd. Overall for the 4 races, this put him 6th – a great placing considering the world class entries. Tommy Soebroto qualified 9th on Saturday but struggled for pace in race 1 coming in 19th. Unfortunately his day got worse – in race 2 he was hit from behind and his bumper was damaged so he could not finish. As Sunday began, luck still wasn´t with him. In race 3 he was pushed off and was unable to restart. But he had a great run in race 4 to come in 11th. With only one year of racing experience, his qualifying session and race 4 were quite an achievement. Stratos Motorsports was honoured to be invited and participate in such a prestigious event. Now the team moves on to the All Stars Karting Invitational Race this coming weekend at Sepang International Circuit, Malaysia.